“Cancel all the camps” was the general consensus. n January 2016, my husband, Brian, and I became full-time missionaries to Belgium, leading an evangelistic ministry that serves youth in Europe. The ministry is based out of a beautiful, 400-year-old estate, the Château de Thieusies, which has been converted into a youth camp facility. As the youth directors for the Church of God Ministry to the Military (MTTM), we have used the castle for 11 years, renting it for our European Summer Camps for military dependent teenagers stationed abroad. Coming to Belgium to take over management of the facility meant a partnership with the owners, an American charitable foundation (the Rawlings Foundation of Impact Youth Worldwide). This partnership included full sponsorship of every American youth who wants to attend camps there. This was a miracle, providing ample funding for all three of our summer camps in Europe! The excitement turned quickly to hesitancy in November 2015 when we heard about the devastating terrorist attacks in Paris. The château was just two hours from the attacks. Keeping in mind that physical warfare is often an indicator of spiritual warfare, we decided that our inaugural event at the château should emphasize prayer. We invited Douglas and Barbara Small to come lead a prayer summit in February 2016. Although the event was only weeks after we arrived in the country, the need for a prayer gathering resonated with pastors and was attended by over 70 leaders from 17 churches, including our MTTM centers from Belgium, Germany, and Italy as well as French-speaking churches in Belgium. We prayed in English; we prayed in French. We prayed in the Spirit and with understanding. We closed the weekend of intercession with our hearts full of faith and the Holy Spirit, ready for whatever would come next. I took a screen shot of my flight check-in, just in case I’d need the information to reschedule. As the details of the terrorist bombings at the Brussels International Airport unfolded, my email and phone lit up with messages from friends, pastors, and parents of the youth we serve. I assured them I was not at the airport (in fact, a 50-Euro savings is the only reason I had booked a later flight). But because the château is only 45 minutes from the airport, it was included in the travel ban immediately implemented for all U.S. military personnel in Europe. The next day, sitting at home because no airports were able to rebook me due to handling rerouted flights, I called Robert Moore, international director for Ministry to the Military. I had been praying, but I felt a heaviness and was deeply unsettled. We were here in Belgium by miraculous circumstances. For the first time in the history of our ministry (Jacob’s Generation), we had the resources for buses and camp funds to sponsor every youth. The thought that we would have to cancel was unimaginable. On the first night of the final camp, students knocked chairs down to get to the altar. As I began to seek the Lord in prayer, I tried to hear His voice clearly through the barrage of nay-saying emails and travel warnings, and even my own common sense. Yet, when my spirit and mind were quiet enough to hear, a promise from a well-known passage was resounding: “You prepare a table before me in the presence of my enemies” (Ps. 23:5 NKJV). 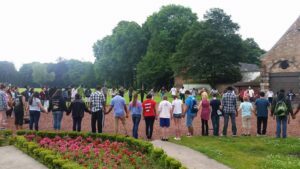 On June 19, the day the U.S. Government ended the travel ban to Belgium, our Jacob’s Generation volunteer ministry team gathered in front of the château. No one knew of the scripture I had been clinging to except my husband and Robert and Patty Moore. Our team came together in intercessory prayer that Sunday evening. A young adult volunteering returned from her prayer time about 30 minutes later and said to the group, “I feel like the Lord is saying, ‘It’s done. Don’t worry. It’s all prepared.’” They had not been told about the verse I had been clinging to for the previous three months. The next day, the first of three camps began with youth from Germany, Italy, England, Spain, the U.S., and Belgium. Attendance was more than double from any prior year. We were honored to serve 265 teenage children of American military personnel stationed overseas, with 79 youth professing Jesus Christ as Lord and Savior for the first time. Meanwhile, a connection was made with La Nouvelle Jerusalem, the Church of God in Belgium. The churches were astonished that the camps were offered free of charge, so they recruited teens from the streets of Brussels, Leuven, Charleroi, and Mons and filled the August camps. Throughout the summer, 800 individuals participated, culminating in over 200 salvation experiences. At the final camp, there were more unchurched youth present than at any other. During the close of the first service, they literally knocked chairs down to get to the altar, and by the end of the night, every one of them was saved. Truly, the Lord hears the intercession of His people and, whether in times of peace or in the presence of the Enemy, He has everything prepared. Visit www.jacobsgen.org to learn more.